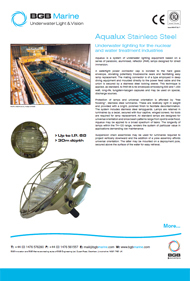 Aqualux is a system of underwater lighting equipment based on a series of parabolic, aluminised, reflector (PAR) lamps designed for direct immersion. A watertight power connector cap is bonded to the hard glass envelope, obviating potentially troublesome seals and facilitating easy lamp replacement. The mating connector is of a type employed in deep diving equipment and moulded directly to the power feed cable and the union is secured by a stainless steel locking sleeve. Protection of lamps and universal orientation is afforded by "free flooding”, stainless steel luminaires. These are relatively light in weight and provided with a bright, polished finish to facilitate decontamination. The system includes stainless steel lampguards. Lamps are retained in luminaires by a bezel, secured with four captive, winged screws. No tools are required for lamp replacement. All standard lamps are designed for universal orientation and since beam patterns range from spot to wide flood, Aqualux may be applied to a broad spectrum of tasks. The longevity of lamps within the TH-120 range, renders the system of particular value in applications demanding low maintenance. secured above the surface of the water for easy retrieval.